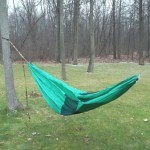 I hope that you read my initial impressions of the Molly Mac Gear Bivy Hammock. It will make it a lot easier reading this first hang report. 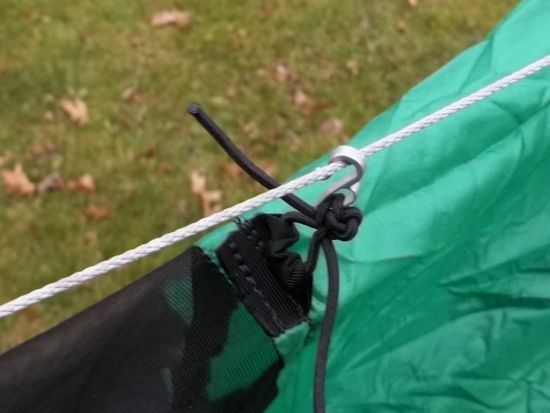 To begin with, I’d like to say that for my personal preference, I added a Dutch Quilt Hook to the shock cord used to hold the bivy off your face. 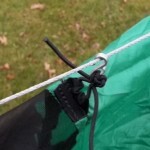 It secures the bivy quickly and easily without any need for tying or snapping in anything. Secondly, while MacEntyre says that the Bivy Hammock is “rated for those who weigh not much more than 200 pounds”, I believe it will take at least 250 pounds minimum. However that is my opinion and not binding on the manufacturer. Friday was a little chilly, not getting above 28* and as this was a test of the system, not my ability to withstand the winter temps, I held off. Saturday was a touch warmer with the temps getting to 37*, so I figured it was the best I was going to get for quite a while. Took my tree huggers and MMC Bivy hammock out to the backyard and hooked it up as I normally would my hammock. Ease of set up was fantastic. The only minor fix needed was that during set up, the included SRL had fallen off. No problem putting it back on and in seconds was ready to go again. 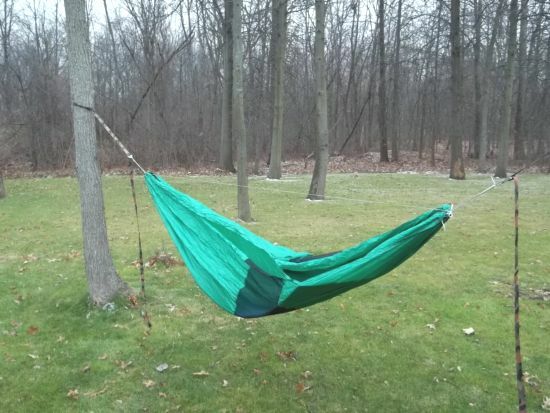 Double layer hammock – I wanted to try it this mode first as winter hanging is a possibility I have considered for the future. 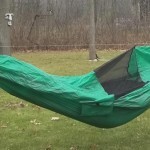 I placed it bug net down and inserted my CCF pad between the two 1.1 ripstop sheets.There was no sign of any strain on the hammock and it indeed quite comfortable in this mode. I could have stayed out there like this for some time, but my photographer was getting cold, so on to the next test. Bug Net Bivy – This was the test I really wanted to do as it would determine whether I would be able to use this for backpacking. I flipped the hammock over and attached the quilt hook to the SRL and cautiously climbed in. This is where my opinion on the weight rating was justified. I weigh between 215 and 225 depending on whose scale I use, and the bivy hammock took it with no exertion at all. Please note that I was also dressed for the cold, so that added some pounds. The only suggestion I would make for the bivy hammock in this mode would be a second shock cord attachment point at the bottom of the no-see-um panel. The winds were blowing around 5 mph and with that, the wind would catch the sides of the bug net and blow up and flap around. Any small tarp or windbreak would prevent this. Just mentioning it, but don’t see it as a flaw in the system. My photographer thought it was too cold and left for the house, but I was still comfortable in my Bivy Hammock. Ground Bivy – This was the one mode I haven’t tested yet. The ground being heavily saturated, I really didn’t want to put it on the ground without a suitable ground cloth. However, when the weather returns to a mild state I will give that mode a complete test. Overall, it is a good set up and one that will most likely become my backpacking hammock set up. It is a unique idea and I would hope that others would give a try. Thanks for reading! Any questions or feedback please leave a comment below.